Brad was ecstatic. He talked fast. 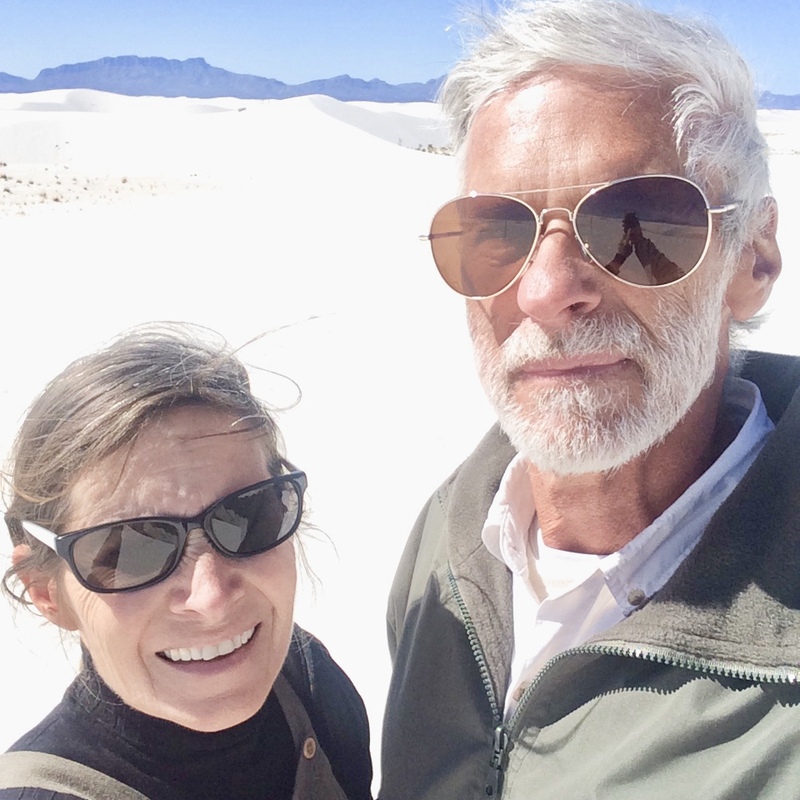 “…and we get to hike into the white sands desert and we can’t leave after sunset and if we find an explosive device we can’t touch it!” Brad’s eyes glowed with excitement. What in the world was he talking about? I got an uneasy feeling. I looked on the map. 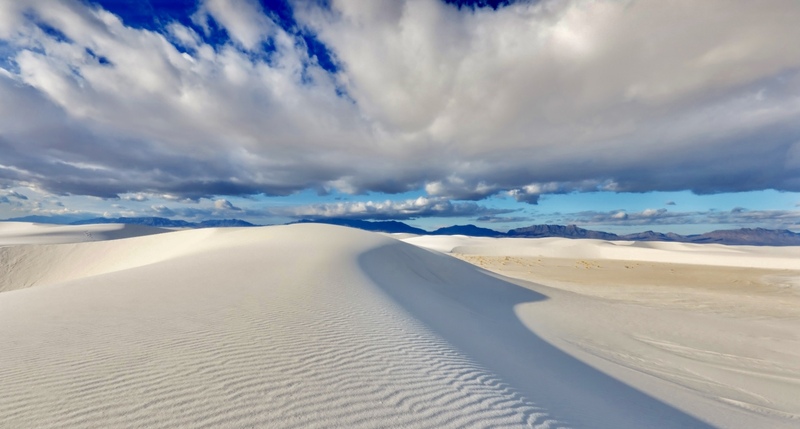 The White Sands Desert is where our military tests missiles. Who in the world would want to camp there??? 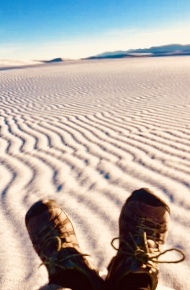 When you purchase a permit to camp White Sands, a uniformed ranger tilts her hat in your direction and glares at you from behind dark sunglasses. My backpack felt heavy (or was that my anticipation?). “We better get started!” Brad chirped eagerly. Brad and I took one last selfie photo (so our children would be able to identify our bodies) and began our hike. 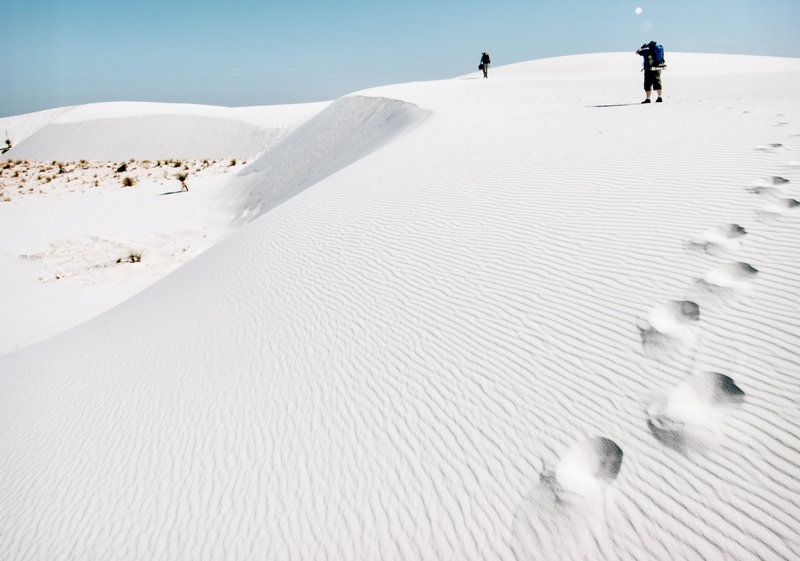 Our boots sunk ankle-deep into the sand as we struggled up huge dunes rising above us. “What in the world are we doing?” I asked myself as I clawed my way up the shifting sand dune to reach the crest. I stepped off the edge of the crest. Suddenly, my top-heavy pack pulled me backward. Thump! I found myself flat on my back sliding on silicone-slick white grains of sand. 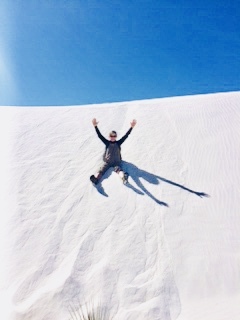 “Hey – this sand is sleddable!” I yelled (in half terror and delight). Brad and I immediately dropped our packs and did some body surfing down the slopes. Fun! Body sledding aside, we eventually reached our designated campsite (basically a post stuck in the ground in the shadows of a giant circle of dunes). 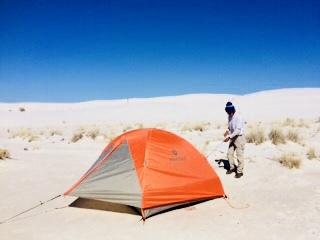 -Did I mention the stern rangers asked us to “control” our potty breaks while camping White Sands? Once the tent was in place, we climbed the dune to watch the sunset. This was eerie. There was no sound but the rasping of wind over sand. This wind created finger waves on the surface beyond my boots. I could be on the moon. I thought I was. Night brought a 20 degree chill and a bowl of icy stars above our heads. We stepped out to shiver in the all-consuming darkness. 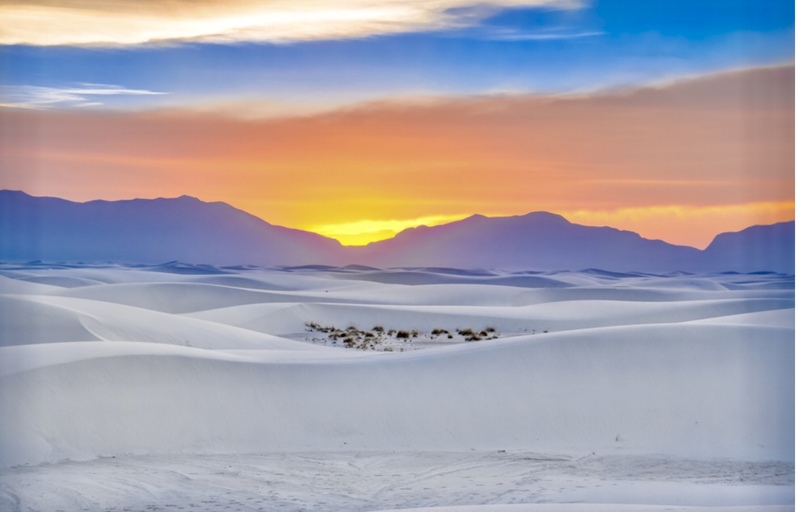 White Sands is a place which devours you. Brad and I were eaten up by our ominous surroundings. We didn’t mind. We were two small dots in the enormity of darkness at night …and two specs in a sea of white when the sun rose. God did a great job with this place! It took us two trips to hike out from our camp cause we were sliding all the way. I have to admit, though, I was happy to see our car at the end of the trail…and a national park latrine. Only Brad was disappointed in our trip to the moon and back. The experience was so wonderful! Awesome!!! Who knew you could camp there?? I credit Brad the adventurer!